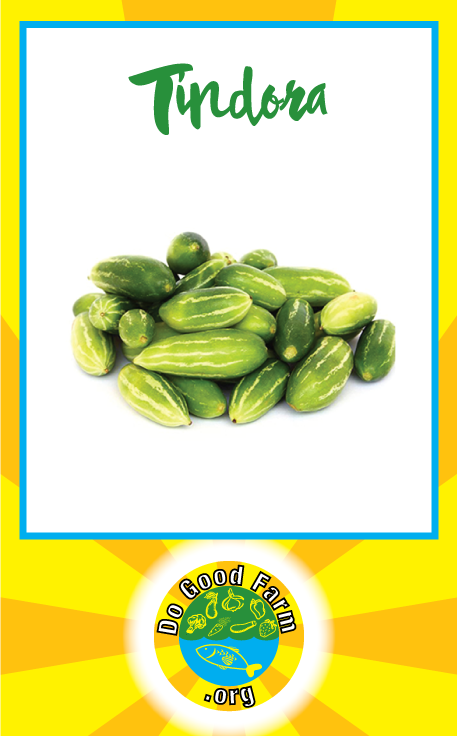 Tindora, also known as the ivy gourd or baby watermelon, little gourd, gentleman’s toes or even gherkin is actually the fruit of an exotic vine. Tindora’s fruits are ovoid to ellipsoid in shape and thus small they are usually known as “berry”. They vary in dimensions from 1″ to 2 1/2″ in length. Their skin is smooth along with variegations of green and white. The clear white flesh of the fruit looks like the appearance as well as taste of the cucumber, showing numerous seeds which create a red color. The flesh is equally crispy as well as tasty in texture having a slightly bitter aftertaste. Mature fruits turn out to be gentle and create a more gratifying quality. Based on variety, a mature tindora fruit’s skin color may also turn out to be bright red. These types of varieties are generally known as “Big Red”. According to a study published in a 1998 issue of the Indian Journal of Medical Sciences, tindora may suppress the activity of certain enzymes involved in glucose production, such as G-6-phosphatase, therefore may be an aid in diabetes control.